If you really enjoy hiking and being outdoors, this trip provides an excellent way of experiencing the best of Komodo and Flores Islands. We take the time to get out of the car and walk through the Land of the Dragons along with the mountainous rainforests of Flores to visit remote cultures. This trip is a must for true land lovers! Arrival at Komodo Airport in Labuan Bajo in west Flores, where you will meet our guide and transfer to the pier at Labuan Bajo for boarding our house boat. Lunch on board as we sail about 3 hours to the islands of Komodo. Our first stop is at Pink Beach where we will enjoy the waters with swimming and snorkeling followed by an excellent local dinner in a beautiful setting prior to overnight on the boat. We are up at 6am to have breakfast and then on our way trekking for over 3 hours from Loh Liang to Loh Sabita on Komodo Island. As we trek, it will provide the best opportunity to see the dragons and their prey as we pass along dragon nests and out into the sunshine across an exposed savannah that is studded with Lontar Palms. Additional local guides are provided to maximize our chances of meeting the Komodo Dragons and to ensure the safety of all travelers. One we arrive in Loh sabita, we get back onboard and continue by boat back to Labuanbajo, with snorkeling at Manta point if time permitted. Overnight at Puri Sari Hotel or similar. Upon enjoying our breakfast at the hotel, we depart by car to Roe village, which is about 21 km. 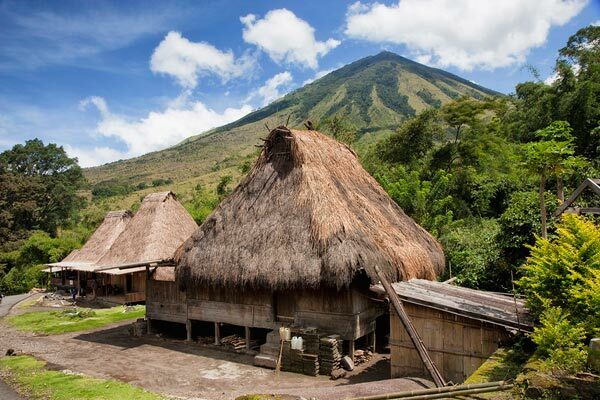 We will first visit the Waerebo Traditional Village in the province of Manggarai, Flores. We then start here for your 3 hour trekking up through the dense Mbeliling forest and on to Werang. On the way you can see Flores endemic birds, such as the Hanging-parrot, Loriculus Flosculus, Flores Crow Corvus Florensis and many other birds making it a bird-watchers delight! As we explore the pure, native rainforest, we will have contact with many of the local people and enjoy your time by relaxing at Cunca Rami Waterfall. Lunch will be provided by local people in Werang, followed by an afternoon drive to Sano Nggoang Crater. This area consists of slopes and flat ridges which are formed by volcanic activity resulting in a crater lake in the active volcanic mountain of Wae Sano. Dinner and Overnight at local family house. After a local breakfast at the local house, you start the new day by hiking the beautiful surrounds of the deepest crater lake called Sano Nggoang. During this 2-3 hours trek, we will experience the local life in this very remote region along with truly unspoiled natural forests and fauna, including the wonderful birds of Flores. After we complete our lunch, we will continue in the afternoon with a drive to Denge. There, you will enjoy your time with the local people and experience an overnight stay at local family house in Denge Waerebo Traditional Village, Manggarai, Flores. Once you wake and have a light breakfast, you will start an approx. 4 hours trek to the unique Wae Rebo village. The village represents a true authentic way of providing housing for the local Manggarai culture and is located about 1000m above sea level in the middle of the mountains. There are seven traditional houses all built in the same form with six of them for the local people and the extra house for the visitors. Still untouched, all the houses are still very traditional with 5-story high roofs that house the storage of goods in the top four floors with all the living areas on the bottom floor. Here you have the chance to reach out with these people and experience how they experience their culture, life and activities. This is a unique opportunity to realize how remote cultures live in the ways of the past and gain an acceptance of who these people are. We will have dinner and stay the night here as they provide sleeping mattresses. Overnight will be at the elderly Florenese women’s home which houses up to 8 families. After breakfast we will take a morning drive to up to Rahong village to begin our trek through the rich forests and rice terraces to the beautiful Tengkulese waterfall. We can take our time and spend it swimming, hiking around and simply enjoying the waterfall. Once back to your car, you will continue driving to Cancar to visit how Flores conducts their work in agriculture and allows you to sit with the local farmers during lunch. You will get a real sense of how the locals work their daily lives to produce their crops. We then return to Ruteng for dinner and overnight at Susteran MBC, Ruteng. After breakfast departure from your Ruteng hotel we will visit Golo Curu with its stunning scenery and the mountains of Mandosawu. Along the north side of the city is eye-catching panorama of more spider rice fields strung along the base of the mountains. On the way, we will stop at a variety of places in the mountains and along the southern coast of Flores, including Rana Mese Lake and Aimere, where it famous for its “sopi/ moke” distillation and fresh palm juice tapping. Dinner and overnight at Villa Sylverin or Happy Happy Hotel. We awake in the early morning at 5 am to drive up to Wawo Muda volcano. Once there we will continue our trekking with a 1.5 hour hike up to the top that offers fantastic views of the island and other cone-shaped volcanoes in the distance. Along the way, you will also experience some of the local villagers as they go about their daily activity. Once back to your hotel, we will spend the afternoon visiting Soa hot springs for a much needed soak. Dinner and overnight at Villa Sylverin or Happy Happy Hotel. We arise early in the morning at 4.30 to drive/hike up and experience sunrise at the top of Mt. Kelimutu where exists three exquisitely colored lakes that consistently change color over time. This is truly one of the most spectacular and mysterious sights in Indonesia. We return through winding roads along the mountain side to your hotel for breakfast. We continue on with a visit to a Wolowaru traditional village and proceed to Paga Beach and the town of Maumere. Dinner and overnight at Sea World Club in Maumere.